To prepare salad, combine lettuce and remaining ingredients in a large bowl. 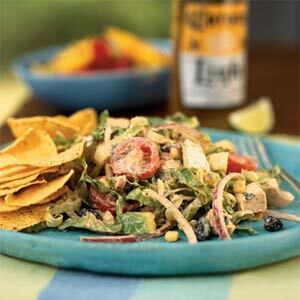 Drizzle dressing over salad; toss gently to coat. Serve immediately. Tip: Add a spoonful of adobo sauce for a spicier salad. Kidney or pinto beans also taste great in this dish. Did you know you can search for a specific ingredient or a particular recipe name? Just type your search term into the box in the top left of the window and hit "Search Blog." If a recipe is marked "Untried" it means I have not made it yet. If you try it, please make a comment and let me know how it went.